Want to show off your skills as a brilliant Mexican chef? 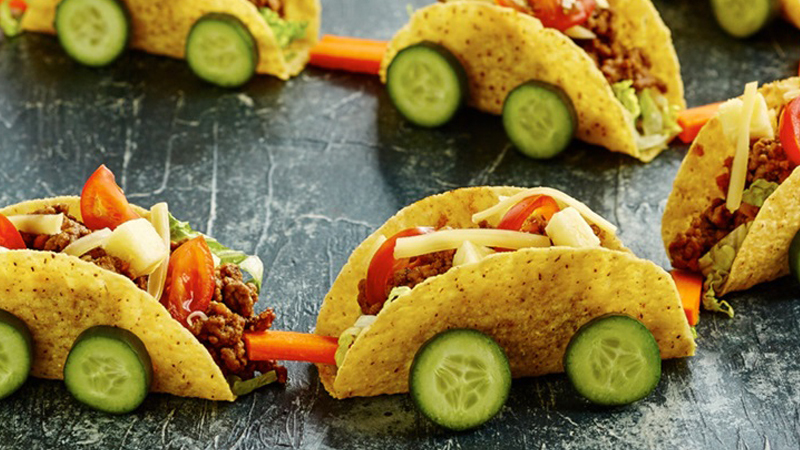 Then create our kid friendly beef mini taco train recipe! Heat the oil in a large frying pan add beef and cook for 5 minutes, stirring with a wooden spoon to break up any lumps. Add sweet potato, Taco Spice Mix and stir for 3 minutes. Add ½ cup water and simmer for 2 minutes or until sauce thickens. For crunchy Mini Taco Shells – follow on pack instructions. Fill tacos with lettuce, beef, tomatoes, pineapple, cheese, sour cream and Mild Taco Sauce. Make wheels with cucumber slices. Arrange on a large board or tray in the shape of a train with the taco carriages connected with carrot sticks.